Can’t wait to try this – sounds like a great summer cocktail! I’m on a Paloma kick – tequila, grapefruit juice, lime juice, simple syrup and club soda (even better with grapefruit La Croix!). Sooo refreshing and summery! I adore Pimms cups! Had one just like this at Maison Jazz in New Orleans. Great memory and a great drink. Happy Memorial Day weekend! My go-to lately have been mojitos, but this looks incredible! Wow, yum! This looks like the ideal summer drink I’ve been searching for! After seeing this, I immediately pinned it, so it is definitely on my to-do list! Gin and lemonade! (And a little sprite if you have it) so good and so perfect for summer! Mmm…this looks so refreshing! I love Arnold Palmers in the summer…topped with a touch of lemoncello. Oh yeah. i like your ideas for a drink. I prefer natural flavors over soda any day. Pimm’s Cup is the classic British summer cocktail. Pitchers are on every table and the minute the sun comes out, a glass or four of Pimm’s is literally the best thing in the world. It’s relatively low in alcohol, which means the bottomless pitcher goes down like iced tea. I love Pimm’s cups! They are so perfect for summer. Gin is something I used to hate but have grown to loooove. Especially in the summer! I have a recipe on my site for a grapefruit-thyme gin spritzer that is amazing! I’ll be revisiting that recipe soon for sure! I’m British and such a stereotype – as soon as it gets warm, the Pimms comes out. I often end up using whatever fruit I have in, and whatever soda is in the pantry. It is great with Sprite! Pimms = summer for me! My local watering hole makes a drink that is gin, cucumber, lime juice and thyme. It’s soooo refreshing! With this drink/meal, you don’t need to make dinner! Fewer dishes… hooray for dinner with a pretty straw! That is the most stuffed pimms cup I’ve ever seen!! NEED this! I love gin. Nothing beats a gin&tonic for me and I tend to keep it simple, but there are so many interesting twists to try. I love a cucumber gin&t or an earl grey one. Herbs work really well with gin – mint, thyme, rosemary – as do citrus fruits. Also, Negroni. Negronis are the best. You should try sloe gin as well, it has a bright grapefruit note And it works well with lemonade or tonic water. we love gin in our house. And I have plans to post a gin cocktail, soon! A spin on a Bees Knees because gin and honey can’t be a bad thing! Your photos never cease to slay me lady! This is another killer, and even though it’s getting on Winter in my hemisphere, we’re not kidding anyone that it’s cold. So hell yeah bring on the Pimms! Gin gin mule. Amazing. You will love it. Gin, ginger beer, mint, simple syrup, crushed ice. Yas! This. So, so this! Ever since were in London a few years back, the Pimm’s cup is our go to summer drink! Love the addition of ginger beer, we recently found diet ginger beer to cut back on the sugar. Love that you soaked the strawberries over night, must try that. Last summer we added cucumber and lime to our gin and tonic, so much better. This sounds delicious! Try a Bee’s Knee’s. I didn’t know I liked gin until we made these! Oh, you have to try adding St. Germain liquor to Hendricks gin, a glug of grapefruit juice, a splash of lime, and top it off with a splash of club soda. The St. Germain MAKES the gin really sing. I LOVE these things…. These couldn’t be more fabulous and your styling is making me thirsty! My new fave is a Moscow mule with a splash of Pimm’s, thanks to a tip from the bartender at Mala in Maui! Taste the sunshine!! I just LOVE gin! My favourite is Hendrick’s with tonic, lime and cucumber, and just a drop or two of bitters. Also delish with grapefruit soda (or grapefruit perrier) and cucumber. Always cucumber! buuuut, I’m actually not-so-secretly a senior citizen on the inside. A lot of 60s on 6 listening happening here. But love listening to Zac Brown Band, Alabama Shakes, and The Arkells in the summer. What a gorgeous looking drink!! So summery! I’ve actually never tried Pimm’s before, but it sounds so good! Gin is my favorite. Gin + peach Izze is the best and Delicious. Also Buena Vista Social Club on repeat. You make me feel glad this day because of this Strawberry Pimm’s Cup whom I am looking for and I also feel excited to have found your site the recipes especially! Your recipes looks so delicious and fabulous, I am craving for this. I cannot wait to try this recipe for diet. Thank you so much for this beautiful recipe you offer for us as FREE. Great! If you are into the grapefruit, you need to try a Gemini – grapefruit, vodka, elderflower, with a champagne topper. So easy but sooooo good & refreshing! Thanks for yet another great post! We LOVE Pimm’s in London and drink it just like this but with lemonade. Divine..
Another great cocktail we’re fond of over here is called the Eastern Standard. It’s the signature cocktail at Shoreditch House: slices of cucumber, mint leaves, lime juice, sugar syrup and good quality gin get smashed up together in a cocktail shaker, and served in a swanky glass with a fresh slice of cucumber. Perfect warm weather drink! This looks delicious! Can’t wait to make! I adore gin and drink it all year round…loving gin and grapefruit juice right now! Last summer my cocktail of choice was a version of the Pamplemousse: gin, elderflower liquer (I prefer Pur ro St. Germain), pink grapefruit juice, and some lemon or lime. And basil makes a great addition. 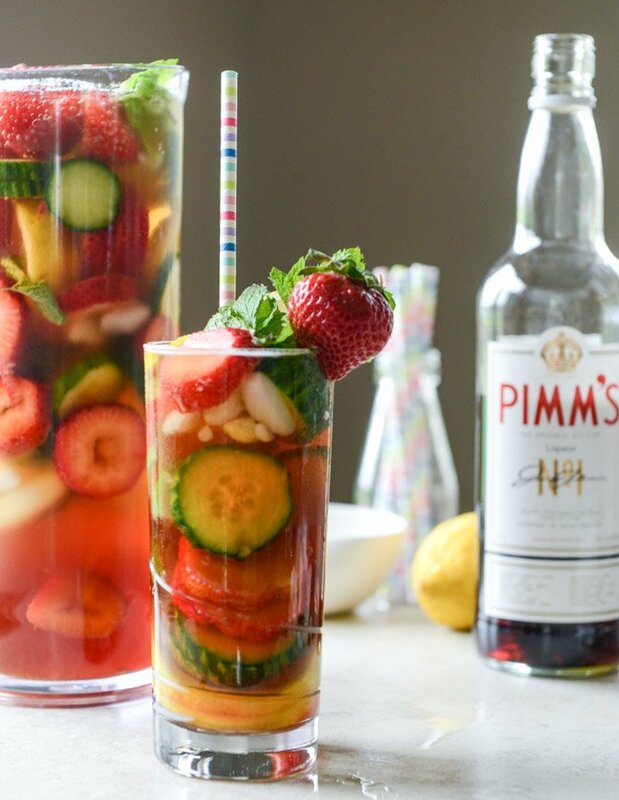 Definitely going for Pimm’s this summer. I am also a grandpa and I love to drink gin. Lately we’ve been doing gin + bitter lemon over lots of crushed ice with fresh mint. SO refreshing! Pimm;s cup is such a classic and definitely a favorite of mine. Can’t wait to try your strawberry version! Love Pimm’s — especially at Napolean’s in New Orleans. I haven’t been able to find a source for Pimm’s in Cleveland, OH area. Not quite ready to order a case of Pimm’s. GORGEOUS. I have been looking for Pimms, but have yet to find it! It’s def on my summer bucket list! Where do you find Pimm’s? This is what we ordered everywhere in the UK, but I haven’t found it anywhere in the US! Best Gin drink (in my humble opinion) is Corpse Reviver Number 2. It was originally meant as a hangover cure (hence weird name) but its lemony and smooth and amazing. Look it up and try it, seriously. So my drink of choice is usually gin and my husband calls me an old man for it. It’s nice to know I’m not alone! The cocktail that turned me on to gin was gin (I prefer Tanqueray or, if you’d like, the more citrus forward version in the prettier bottle, Tanqueray 10) with rosemary simple syrup, lime juice, and fizzy water (like club soda). You can’t go wrong with G+T with a quality tonic water (cough, Fever Tree). And the Bee’s Knees is super summery (honey simple syrup, gin, and lemon juice), as is a lavender simple syrup + gin + lime juice + fizzy water (or get real crazy and make it a lavender negroni!) Ummm or you can combine my two obsessions, gin + Aperol (maybe some grapefruit juice and fizz with that?). It’s electric pink! I had my first PIMM’S cup in New Orleans 3 years ago, and have been saying I’ll make it at home ever since. Have I yet? No. Will I now? OH YES. Pingback: memorial day weekend » hk in love. Apparently your grandfather and I have something in common b/c gin is my go-to liquor…and this looks delicious! Yum! Looks so good! I’m going to try this one of these days. I had big plans to drink so much Pimm’s last weekend, but I ended up in the hospital for the week. Not Pimm’s related. I’m definitely making this as soon as I feel better. It’s beautiful. I also had my first Pimm’s Cup in New Orleans! I always have a bottle on the bar now and I love hearing people’s relationship to Pimm’s. This recipe is inspiring for summer drinks on the porch and the mint I have coming in my CSA this week! Pingback: These 17 Recipes Are Everything You Need To Be Eating This Summer - Viral Posts Ninja! Pingback: 17 New Summery Recipes Guaranteed To Make Your Dinner Guests Rave - Viral Posts Ninja!